Can Intentionally Throwing At A Batter Be A Crime In Maryland? On Sunday night in Washington D.C., Nationals 19 year old baseball phenom Bryce Harper came up to bat in the bottom of the first inning. Veteran Phllies pitcher, Cole Hamels then proceeded to throw his first pitch directly at the lower back of Harper. Harper bent over in obvious pain for a few seconds, trotted off to first base, and then scored the first run of the game a few pitches later. After the game, the veteran pitcher admitted that he purposely threw the pitch in Harper’s direction, and fully intended to hit him. Hamels stated that throwing at Harper was his way of welcoming the rookie sensation to the major leagues. The commissioner of baseball however was not impressed with Hamels’ actions nor his honesty, and suspended the pitcher for 5 games. The main issue up for debate throughout the country is whether Hamels’ actions hurt his team, and whether the suspension was deserved. But this being a Baltimore criminal lawyer blog, and not a sports blog, the relevant issue is whether the pitcher could be subject to criminal charges for his actions. The day after the incident, a Los Angeles prosecutor called ESPN radio’s Colin Cowherd and angrily boasted that if it were up to him, the pitcher would be facing felony aggravated assault with a deadly weapon charges. The overzealous L.A. prosecuting lawyer argued that the pitcher would have no defense to the criminal charges because he confessed, and summarily convicted the pitcher of a felony on the air. There are two reasons why this prosecutor is entirely off base, one being legal and the other being ethical. Legally speaking, there is no way that Phillies pitcher Cole Hamels could be convicted of aggravated assault with a deadly weapon in Maryland or any other state. Each crime is made up of certain elements, and in all criminal cases a prosecuting lawyer is required to prove the elements of the charged crime beyond a reasonable doubt. Aggravated assault, or assault in the first degree as it is called in Maryland, is a crime made up of multiple elements. The elements for aggravated assault could vary from state to state, but generally speaking, a prosecuting lawyer must prove that the defendant committed an intentional and unlawful threat or act to do violence, that the defendant had the ability to carry out the threat, and that the victim was placed in fear that violence was about to take place. Prosecutors must also prove that the assault was carried out with a deadly weapon. If Washington D.C. prosecutors decided to pursue charges against the Phillies pitcher they would have trouble proving almost all the elements of aggravated assault. Prosecuting lawyers would be able to prove that a baseball thrown at 90 mph is a deadly weapon, and there would be little argument from defense lawyers. However, in this particular incident prosecutors would not be able to prove that Bryce Harper was placed in fear that violence was about to take place. The young rookie would never testify against a fellow ballplayer, but more importantly if he were to testify, there is no way that he would say he was placed in fear of imminent violence simply because he wasn’t. The pitch was thrown at Harper’s backside, where there is little danger of injury, and he probably even expected for that to happen once or twice in his hyped rookie season. 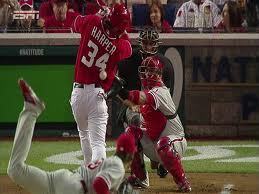 Prosecutors would also struggle to prove that the pitcher intended to do violence to Harper. Legally, a case for aggravated assault against Hamels would never stand up in court, and any reasonable prosecutor would understand this and not waste the public’s time. It is far more troubling though that a prosecuting lawyer would go against their ethical obligations as public servants and even consider filing charges in a case like this. A future post related to this incident will detail the ethical duties of prosecutors, and how they can stray from their sworn obligation to seek justice. Benjamin Herbst is a Maryland criminal lawyer who specializes in all criminal cases in Maryland including assault. If you or someone you know has been charged with or is being investigated for assault in Maryland contact a Baltimore assault lawyer for a free consultation.